The error 0xc0000022 is often related to tradition applications encountering compatibility issues with the latest versions of Windows (Windows 10 and Windows 8.1). However you may also experience this error message when running Adobe Acrobat reader, opening a PDF file or running another Adobe product. Some antivirus suites are determined to trigger this problem by blocking the authorizations needed by the application that is showing the error. The error message says: The application was unable to start correctly (0xc0000022). Click OK to close the application. Windows application that is unable to access the other files that are necessary for it to work. Windows system file that became corrupt because of a disk write error. Press Win + R to open a Run window. Type appwiz.cpl and hit Enter to open Programs and Features. 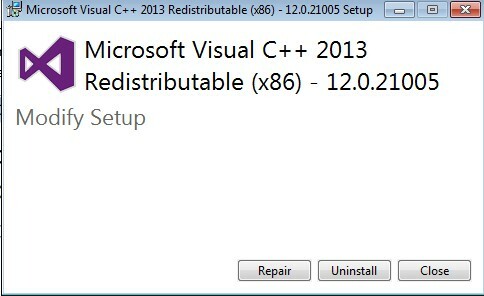 Scroll down to Microsoft Visual C++ 2013 Redistributable packages and right-click on the first entry. Then, click on Change. Click the Repair button and then hit Yes when the User Account Control pop-up is shown. Once the setup is successful, repeat Step 2 and Step 3 with all the remaining Microsoft Visual C++ 2013 packages. 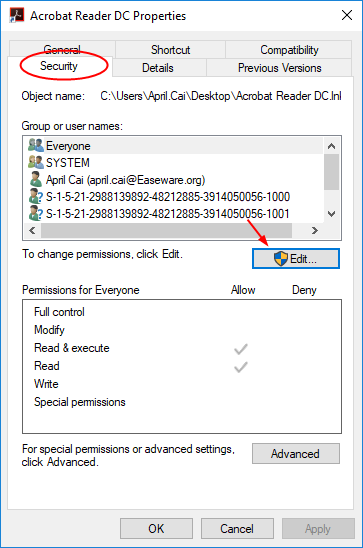 Once all the Microsoft Visual C++ 2013 packages have been repaired, restart your machine and try to re-launch Acrobat reader (or open a PDF file). On your desktop, right-click on the shortcut of your Acrobat Reader and click Properties. Go to Security tab, then click Edit. Select your account, and check on Full control. Then click Apply > OK to save your settings. Close the Properties window. Then run your Acrobat Reader to see if it works.